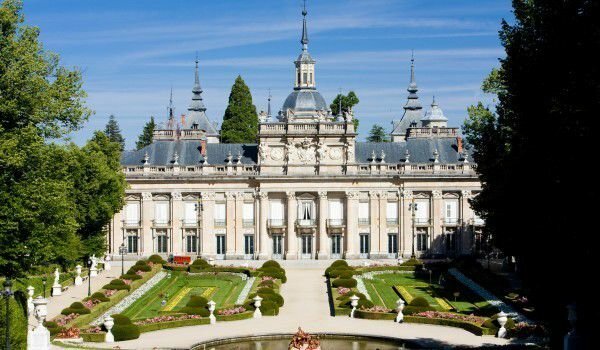 Royal Palace of La Granja de San Ildefonso is an amazing baroque palace complex that was once a summer royal residence and an excellent example of a European palace architecture. The palace was built on the northern slopes of the Sierra de Guadarrama, which is famous for its dense trees. Due to its location deep in the natural area, Castle La Granja became a favorite hunting ground of many Castilian kings. The history of the Royal Palace of La Granja de San Ildefonso began in 1450 when Henry IV rises in the mountainous region of Sierra de Guadarama a hunting lodge. However, later Isabella I of Castile gave La Granja to the monks from the monastery - Parral monastery. It is they who built the farm where the name actually comes La Granja, which in Spanish translates to farm. Along with La Granja the monks built a shelter for homeless people. In 1719 Philip V purchased the property from the monks and the palace. It was then that a major reconstruction on the foundations of earlier hunting lodge began. The Monarch’s grand plan envisages the construction of a new palace and gardens modeled on Versailles, built by his grandfather, King of France - Louis XIV of France. Like the castle in Versailles, La Granja began at the seat of legal power and gradually passes into the hands of monarchs. The gardens of the Royal Palace of La Granja are something worth seeing. They are incredibly beautiful and perfectly arranged and are made entirely on the model of Versailles and around them remain a dense mountain forest. There are twenty-six amazing sculptural fountains that adorn the park. All the fountains are themes from classical mythology, including Greek deities, allegories and scenes from myths. To avoid corrosion of the statues, they are painted so as to imitate bronze, and the exquisite imitation of marble gives the fresh look of the mythological figures.